Levant, L. (2013). 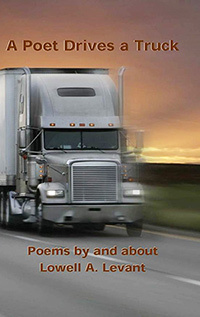 A Poet Drives A Truck: Poems by and about Lowell A. Levant. Copley, OH: Truck Stop Press. ISBN: 978-0-65864-45-7. Paperback, 147 pages. “Readers will notice the complex depth in his writing about work, machinery, trucks, equipment, repair, and maintenance -- all in a deceptively befuddled voice that masks the surprising competence of what is actually being done. These poems are a unique presence in the real world and have great confidence and firmness.” Gary Snyder, author of Turtle Island, 1975 winner of the Pulitzer Prize for Poetry. “There is an extraordinary quality to Lowell’s poems, which I noticed the first night I met him at a group reading. I was very struck by the poem “Enkidu,” indeed, both the force and power of his imagination at work and that someone was writing a poem about that figure from Gilgamesh, not something that showed up in poetry readings in those days!“ Kenneth Irby, author of The Intent On: Collected Poems, 1962-2006. “Lowell’s elaborate pointless digressions best represents one’s actual experience, free from rational or conceptual posturing, a self-aware consciousness working it out with the acute eye of an opened mind.” Will Staple, author of Luminosita Numinosa: New Poems, 2002. “Lowell Levant bore one of the purest and most lyrical poetic voices of the wild and wondrous 1960s in Berkeley, and continued to write and read inspired poetry until his sad passing in 2010.” Gene Anderson, author of The Pursuit of Ecotopia.